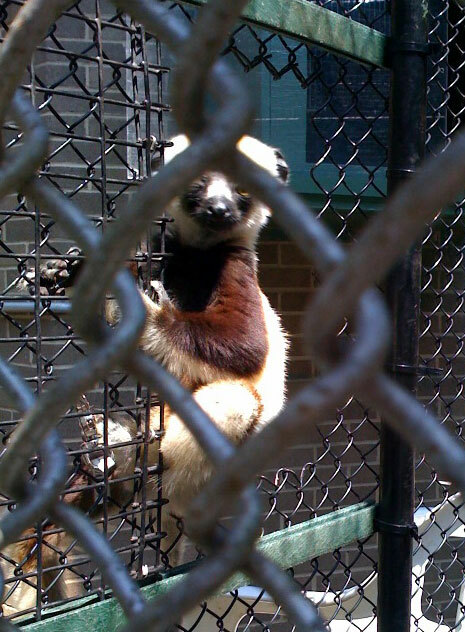 Monica and I got to go to the Duke Lemur Center in Durham, NC today for business. It was great! I took some pictures through the fences with my iPhone camera, and this was the best of them. I’m afraid I can’t tell you what type of lemur this is, but I’ll find out. Just before the meeting at the Lemur Center, I had a checkup at the Bone Marrow Transplant Clinic. I’ll have the results of my tests on Wednesday. It’s been almost two years since I had a skeletal survey, so I scheduled that for September. The skeletal survey is a series of xrays of the long bones, skull and ribs and spine. I asked about a recent report I read that suggests that PET scans should be used for monitoring myeloma. My doctor does those if there’s activity such as an increasing m-spike and nothing shows up on xrays. The PET can show plasmacytomas and other activity. I’ve been told that standard radiographs aren’t much good at detecting bone damage until there’s been a significant amount of destruction, so it’s not a good early warning indicator. I’d like to have a PET scan just to see what’s lurking. I know they’re expensive. A few years ago I called around to get the costs at various places because I wanted one, but was told by my insurance company that they weren’t covered for myeloma. At the time, the cheapest PET scan I could find was about $3,000. Did you know you can do that? If you’re not insured, or your coverage isn’t very good, call around to see who has the best deals on tests or procedures. The costs can vary quite significantly between institutions. Another money-saving tactic is to find out what’s covered under what setting. For example, my insurance has me pay 20% of services performed in hospitals. That’s why I have most of my chemo and all of my Zometa infused at a nearby doctor’s office. When I do that, it’s just a $30 copay. Investigate all of your options!